3 Ways To “Rock” Buffalo Wing Sauce in Your Kitchen: Stock It and Rock It! This ready-made Buffalo Wing Sauce is a fridge essential to stock if you LOVE the hot and spicy flavor of Buffalo Chicken. Here are Three Ways to “Rock It” in your kitchen!!! The city of Buffalo, New York is known for their absolutely delicious hot and spicy chicken wings. This sauce offers a convenient way to make similar tasting wings at home. Funny thing is, there are plenty MORE ways to use this sauce other than just tossing it with cooked chicken wings – which I will share in a minute. And, even though I’m singing the praises of Frank’s Red Hot Buffalo Wing Sauce, this is not a sponsored post…I just love the convenient flavor it offers to chicken dishes. I was in Buffalo, New York last weekend where I had chicken wings for lunch – go figure. I was having lunch with a guy I know named Carlyle. We got talking food, and in three short sentences he cracked the code on how to cook chicken. Those may not have been Carlyle’s EXACT words, but they’re pretty darn close…and I totally agree with what he said. So, if you LOVE the hot and spicy flavor of Buffalo Chicken, like I do , then this sauce is for you! Frank’s Buffalo Wing Sauce should be within’ reaching distance of where the Frank’s Red Hot Sauce is stocked at your grocery store or supermarket. Try tossing Frank’s Red Hot Buffalo Wing Sauce with cooked chicken strips. Then place the hot and spicy strips on a kaiser bun with lettuce, tomato and something cool and creamy (blue cheese or Ranch dressing) on top to make a Crispy Buffalo Chicken Sandwich! Searching for a healthier option? Try the Cafe’s Buffalo Chicken Salad. For this recipe you add your Frank’s Red Hot Buffalo Wing Sauce to the creamy dressing for extra tang and spicy zip! Or simply use your Buffalo Wing Sauce to make my FAVORITE sandwich on the Cafe’s Recipe Menu – Buffalo Chicken Sloppy Joe’s (recipe below). It can be made in minutes and there is only one pan to clean-up afterwards (sah-weet!). So what do you think? Will you be stocking and rocking the Frank’s Red Hot Buffalo Wing Sauce in your kitchen? Let me know what you think in the comments. Cheers! Get more “Less Mess” Recipes (and “a-ha” tips to hone your talents in the kitchen) with the Cafe’s Weekly Updates. Comes with a Digital Cup of Recipes – it’s on me! Heat a large skillet over medium-high heat. Add ground chicken. Cook and stir until chicken is fully cooked through and no longer pink, about 6 to 7 minutes. Reduce heat to low. Stir in pizza sauce, green chilies, brown sugar, and Buffalo wing sauce. Mix well. Slice a kaiser bun in half. Spoon chicken mixture over bottom half of bun then top with desired amount of creamy dressing. Save this Recipe on Pinterest for Later! 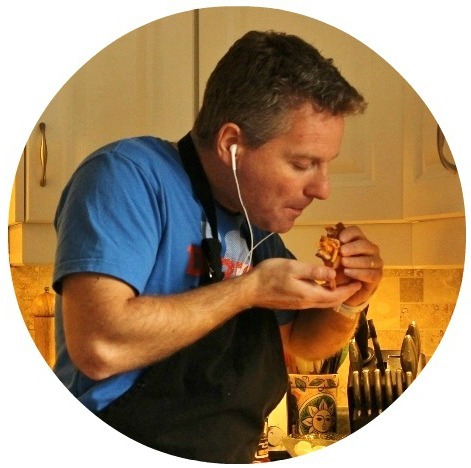 Brent Garell – is the guy behind College Recipe Cafe. He visits local colleges to teach cooking 101 skills, and is the author of the digital cookbook 15-Minute Money Saving Meals for Students: Cup of Recipes for When You Need Food NOW! Available now on Amazon. BTW: I call this a “fridge essential” rather than a “pantry essential” because I prefer to store bottled sauces in the fridge after I open them.